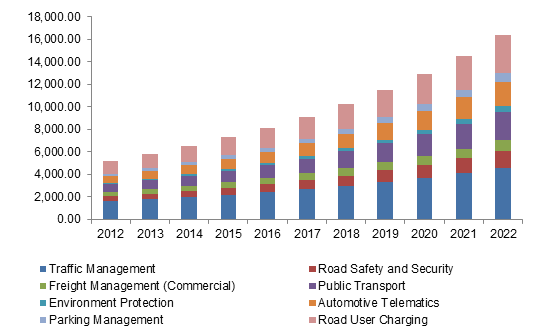 Roadways « Global Market Insights, Inc.
With the robust penetration of smart technologies in the transit space, smart transportation market has been progressing at a prodigious pace in the recent years. The growth can be aptly credited to the efforts of the automotive industry players that have been striving to bring in innovative products to the masses. However, the governmental bureaucracy is also to be accredited with some appreciation, given that these authorized bodies have been extensively adopting smart technologies to solve traffic problems, in addition to providing substantial financial support for modernizing transportation. Urban planners along with technology experts are focusing on building smart cities that will use automated transportation, smart grids, artificial intelligence and digital sensors. Such cities are expected to become a hub for the expansion of the smart transportation industry. Furthermore, the advent of the Internet of Things (IoT) and artificial intelligence (AI) will also be playing a major role in popularizing smart transport, extending its reach across the masses. Indeed, it is being speculated that smart transportation market will emerge as one of most revolutionizing business spaces of the 21st century. China, the biggest automotive market across the globe, has been highly proactive in improvising its automobiles, thereby emerging as a pivotal contributor in smart transportation market. The nation has seemingly deployed intelligent transportation systems such as traffic signal control systems, variable message signs, car navigation, speed cameras and automatic number plate recognition. This is being done primarily to update transportation systems and resolve various social issues that are often indirectly related to poor transportation. In fact, one of the most iconic instances demonstrating China’s proactiveness in smart transportation industry is the construction of an intelligent highway equipped with battery chargers, solar panels and mapping sensors all along the 1.08 km stretch. China also aims at ensuring that at least 10% of all automobiles across the country are electric vehicles. This would warrant that smart highway projects such as the aforementioned are always on the run, thereby providing an added growth avenue for smart transportation industry. The Intelligent Transport System Association of China has recently even declared an investment of USD 30 billion in the intelligent transport industry by 2020 that would help construct electronic charging systems and encourage green transport system. Dubai has recently joined the trend of smart city development. Apparently, under the umbrella of the Dubai Plan 2021, the government is aiming at transforming infrastructure, designing ambitious projects and providing citizens with enhanced benefits. The regional smart transportation market has witnessed increased investment under the Dubai Plan, as transportation is being viewed as a key pillar to the development of a smart city. The Roads and Transport Authority of Dubai has implemented unique smart car rentals that can be collected by tech-savvy commuters on an hourly basis and returned to kiosks located close to metro stations. Apparently, estimates claim that 40% of slow traffic movement in Dubai is caused by drivers looking for a parking spot. On these grounds, intelligent parking systems are being developed that will guide drivers to find parking spots near their destination. Safety of bus commuters is also being developed by the installation of a system of buses that will assess the physical condition of the driver and identify signs of exhaustion or illness. It has been estimated that IoT technologies can amplify Dubai’s potential value to reach $5 billion by 2019. Smart technology, ideally, is still a long time away from reaching market maturation. Besides, even regulatory systems have much progress to make with regards to helping existing roads adapt to the new smart mode of travel. However, smart transit systems offer ubiquitous connectivity, remote sensors, dynamic traffic signals and vehicular communications – commendable social and economic benefits that are certain to aid smart transportation industry emerge as a mainstream vertical. Experts point out that between 2035 and 2045, the advent of autonomous vehicles can save around 585,000 lives while reducing commuting time by 250 million hours per year on a global basis. Also, machine directed vehicles are likely to stray from distractions and will contribute towards improving highway safety. According to certain statistics, autonomous vehicle technology is expected to add $7 trillion to the global economy by 2050 when they will come to constitute more than half the new vehicles sold worldwide. In the forthcoming years, vehicle ownership is likely to be displaced with the rapid proliferation of Mobility-as-a-Service technology. 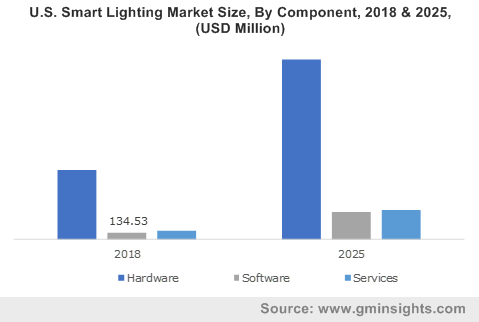 Smart transportation market is expected to witness an altogether new scenario of ride-hailing services and pilotless vehicle options, revolutionizing the automotive & transportation space in its entirety. 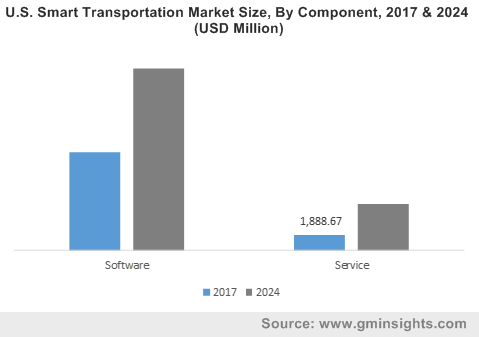 As per estimates, smart transportation industry size is anticipated to increase commendably in the ensuing years, with a target valuation of USD 130 billion by 2024. This entry was posted in Sustainable & Smart Technologies and tagged Airways, Cloud, Component, Deployment Model, Global Smart Transportation Market, Hybrid, Integration Service, Mode of Transportation, On-Premise, Parking Management, Passenger Information System, Railways, Roadways, Security and Surveillance, Services, Smart Transportation Companies, Smart Transportation Market, Smart Transportation Market Analysis, Smart Transportation Market Report, Smart Transportation Market Size, Smart Transportation Market Trends, Software, Support and Maintenance Service, Telematics, Ticket Management, Traffic Management, Training and Consulting Service. The global bitumen market is expected to show an exponential growth curve with the rising road construction, maintenance, and repair activities. Bitumen, also known as asphalt is a necessary binder used in the road construction activities as the product offers high stickiness, viscosity, and superior water resistance properties. Bitumen is also utilized as a sealant and adhesive and finds huge demand in the construction of damns, water tanks, and bridges. The growing construction expenditure, which as per estimates, is likely to touch USD 13 trillion over the coming seven years has in turn accelerated the growth of bitumen industry across the globe. Bitumen market is also witnessing other lucrative growth avenues, owing to exclusive product demand from tire, paints & coatings, battery manufacturing, thermal & acoustic insulation sectors. According to a report compiled by Global Market Insights, Inc., the global bitumen industry size is projected to register a y-o-y growth of 3.7% over the period of 2018-2025. The growing trend of constructing wider roads and flyovers, owing to rising city traffic and population has impelled the growth of global bitumen market share from roadways applications. Indeed, roadways accounted for a prominent 80% of the overall bitumen market share in 2017 on account of the increased number of road construction projects. In this context, it is prudent to mention that polymer modified bitumen is a majorly used product in road surfacing and helps in maintaining the right consistency and strength, thus making the mixture more sustainable to various stresses. 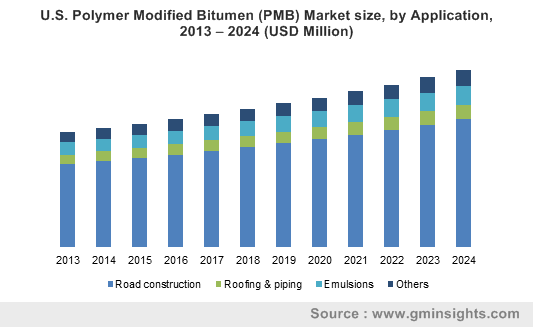 The global polymer modified bitumen market is projected to witness lucrative gains over the coming years, subject to its enhanced elasticity and viscosity properties. Paving bitumen is another type of product used in roads and highways construction. This product is specifically used in the construction of barn floors, running tracks, railway beds, bicycle paths, and tennis courts. As per estimates, paving bitumen held an astonishing 70% of the overall bitumen market share and is projected to expand at a commendable growth rate over 2018-2025. Rising government spending and initiatives for redevelopment and repair of roads and highways in North America have set the regional bitumen market in motion. The region will witness a substantial rise in product demand especially in the waterproofing application, owing to the rapidly growing number of residential remodeling projects. As per estimates, in 2017, waterproofing applications held the second-highest share of the overall bitumen market. Driven by the massive deployment in numerous establishments across North America and other geographies, bitumen market size from waterproofing applications will grow at a CAGR of 4% over 2018-2025. Estimates claim that North America accounted for 30% of the overall bitumen market share in 2017. Driven by the rising number of suburban remodeling projects across the United States and the subsequently growing product demand for waterproofing applications, especially across the U.S., North America bitumen market size, in terms of volume, will register a CAGR of 2.5% over 2018-2025. The competitive landscape of bitumen market is slated to be highly ferocious, and inclusive of prominent industry players such as Chevron Texaco, Exxon Mobil Bouygues S.A, British Petroleum, Petroleos Mexicanos, Indian Oil Corporation, Marathon Oil, NuStar Energy, Nynas AB, JX Nippon Oil & Energy, Villas Austria GmbH, and Total S.A. Brainstorming highly advanced asphalt technologies is a standard tactic adopted by players such as Kraton Corporation, that believes in bringing forth newer products to meet the ever-rising product demand for roofing and paving applications. As per Global market Insights, Inc., the overall bitumen market size is slated to cross a mammoth USD 112 billion by 2024. This entry was posted in Bulk & Specialty Chemicals and tagged Adhesives, Bitumen Market, Bitumen Market Analysis, Bitumen Market Demand, Bitumen Market Size, Cutback, Emulsion, Global Bitumen Market, Insulation, Oxidized, Paving, Polymer Modified, Roadways, Waterproofing. The robust proliferation of the Internet of things, big data, analytics, and mobile technology has positively impacted the growth of ITS market since the last half a decade or so. The automotive industry in particular, which is expanding at an unprecedented pace, has come up to be a technologically revolutionized industry sphere. With the growing number of vehicles, there has been an immense demand for road safety and traffic management to enhance user travel experience. This rising demand to improve transport efficiency has undeniably influenced the expansion of the global intelligent transport system market. Traffic management has been a major challenge due to the growing number of vehicles and multimodal transport. The demand for safety, operational performance and transport efficiency is thus majorly driving the demand for ITS market. Moreover, rising environmental concerns as a result of pollutant emission and depleting fuel resources is also fueling the growth of ITS market to enable congestion free transport. The system improves the transport efficiency by offering features like traffic prediction, traveler information, advisory services, analytics and decision support, ticketing and fare collection, roadside sensors, global positioning systems, and radio frequency tags. ITS services enable vehicles to share positions and data with each other as well as with the network and road infrastructures. On these grounds, ITS is being adopted worldwide to build improved transport strategies, thereby marching towards ‘smart transportation’. Developed economies North America and Europe have apparently made it compulsory for the vehicles to use ESC (Electronic Stability Control) in public as well as private transport. Indeed, the extensive traffic movement on roadways has led to a spurt in the demand for innovative traffic management methodologies. Another major factor propelling the adoption of ITS is the extensive rise in the number of road accidents globally. As per the 2017 Road Safety Annual Report of the International Transport Forum, road fatalities in the U.S. surged by 6.3% between 2010-2016, that has been a matter of concern for the regional government agencies. The U.S. DOT (Department of Transport) as a matter of fact, has started a Federal ITS program that supports the manufacturing of intelligent vehicles and endorses the implementation of intelligent infrastructure. The growing adoption of ITS and the presence of favorable government norms and promotional activities will thus drive the growth of the U.S. ITS market over the coming years. Speaking of the regional terrain though, it comes as no surprise that the Asia Pacific is one of the leading markets for the expansion of the ITS industry, given the widespread scope of the automotive sector in the region. According to Global Market Insights, Inc., APAC is anticipated to account for the second largest share of the overall ITS market by 2025, driven by the fact that the pivotal regional economies such as India, Japan, and China have been making hefty investments in megacities and have also been modernizing their transportation networks for facilitating enhanced trade exchanges. The APAC is also remnant of major government initiatives that are being undertaken for to combat the rising air pollution levels, which would further add momentum to the growth of the APAC ITS market. The robust implementation of the intelligent transport system in the automotive as well as other transportation sectors such as airways, railways, and maritime, will positively impact the commercialization graph of the overall ITS industry. The system is not just a software solution, but is indeed a much wider concept. The data collected by the deployment of ITS can be a major asset for the transportation industry, enabling manufacturers to get a detailed insight about their vehicle performance in various environments. Armed with a vision that targets ‘smart transport’, ITS market is all set to experience a remarkable rise in the coming years. This entry was posted in Automotive & Transportation and tagged Airways, Global Intelligent Transportation System Market, Intelligent Transportation System Market, Intelligent Transportation System Market Growth, Intelligent Transportation System Market Share, Intelligent Transportation System Market Size, Intelligent Transportation System Market Value, ITS Market, Maritime, Railways, Roadways, smart Transportation.